Here is an in-depth review of the Manfrotto 561bhdv Monopod. The 561BHDV-1 is a fairly compact but capable of very high extension, 4-section aluminum fluid monopod. It makes shooting video a breeze because of superior design features. The name Manfrotto evokes the feeling of quality. The 561B-1 has been replaced by the 562B-1. The panning handle is long and ergonomic. It makes smooth panning and tilting easy. The fluid head is lightweight and compact. Manfrotto designed it to work with professional compact video cameras and light prosumer camcorders. The position of the spotting scope and camera are optimized by the addition of a larger sliding plate. The 561-bhdv comes with 3 small legs on the base which add to its stability. This monopod is great for shooting video or digital stills. Videographers like its stability, similar to a Steadicam and say it mimics a crane or jib shot with pan and scan. It's very challenging to shoot active toddlers with a tripod and get steady footage. With video monopods like the Manfrotto 561-bhdv, you can set up real fast and easily follow or move with the action. This monopod is a great tool for any cinematographer that uses a DSLR set-up. You can get smooth, steady footage combined with the quick and easy set up. This feature makes it a great monopod for wedding videographers as well. Wedding and event photographers and videographers need professional results with simple and moveable photography equipment. 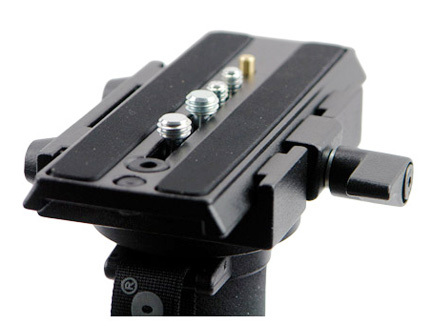 The inclusion of the modified Manfrotto 701-HDV head means it's easy to switch to your tripod. If you have researched the Manfrotto 701 fluid head, you know it has an excellent reputation as a great piece of photography equipment. The Fluid head is a Manfrotto 701 that has been modified to screw atop this monopod. If you are researching this monopod, I'm pretty sure you know the praise that head receives. The ball-type bearing at the feet makes for incredibly fluid panning. Some would consider it to be heavy and it certainly is heavier than shorter monopods without feet and a quality fluid head. The extra weight is well worth it and adds to the stability. I've purchase photography equipment for many years, starting with ebay when I began with only used camera equipment. I moved on to B+H PhotoVideo in New York, but for the last several years, I prefer Amazon fora almost everything I buy on-line. No matter where you buy your monopods or other equipment, you should take advantage of all of the consumer reviews that are written on Amazon. It is a great way to learn about the quality and use-ability of products from those who have purchased and used them. Monopods have been used for many years with still photography. Now that many cameras do both, it's nice to have Manfrotto make a monopod that can do both too. Manfrotto combined the fluid head, the folding feet and the fluid cartridge to work together perfectly. The only adjustment made by the fluid head is tilt. The entire head and monopod assembly is rigid. The red at the foot of the monopod is the fluid pan mechanism.The entire assembly moves as a single unit because the damping mechanism is at the base. You don't have to loosen the handle grip. 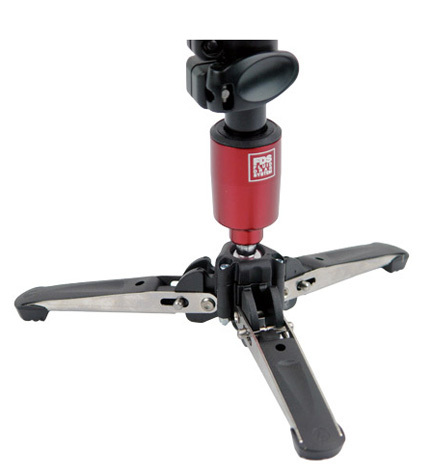 You can use your own feet, placed on top of the Manfrotto 561bhdv-1 monopod feet to get extra stability. Another bonus - the extended height is tall enough to get over the head of crowds, perfect for video, especially if your camera has a tilt out screen. It has a nice long range of height from 2 1/2 feet to 6 1/2 feet. At 6 1/2 you are able to shoot above the heads of most people in a crowded environment. Male Thread Size 1/4" & 3/8"
Available accessories include the Manfrotto - 501PL Sliding Quick Release Plate with 1/4"-20 & 3/8" Screws and the Manfrotto - 080 Monopod Belt Pouch. 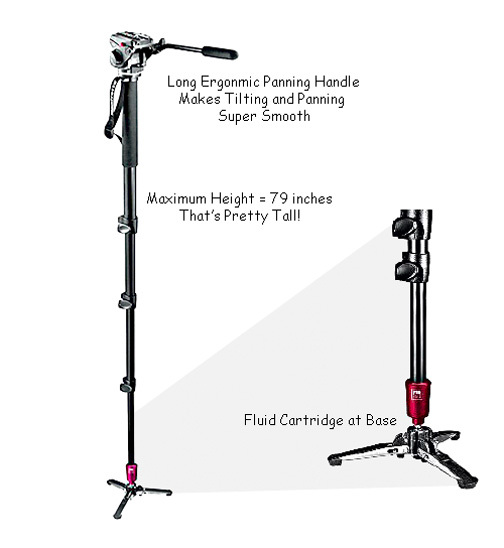 A great way to evaluate a monopod is to carefully read the most detailed reviews by buyers. The illustration below shows how high the Manfrotto 561bhdv-1 rates with buyers from the two major on line retailers of Manfrotto Monopods. The graphic above is from Amazon, my favorite on-line retailer ofr many products including camera equipment and accessories. I also buy some of my camera gadgets from B&H Photo/video in New York City. Almost 100% of respondents who bought the Manfrotto 561bhdv-1 monopod from B & H would recommend this to a friend. Without a doubt, it's the manfrotto 561bhdv fluid cartridge base! If you enjoyed this review of the Manfrotto 561bhdv monopod, please share it with a friend.